snowdeal.org > ex machina: the eric update - day 240: sitting up *and* playing! the eric update - day 240: sitting up *and* playing! was it really only a month ago that it was remarkable that odin was sitting up unassisted? well that's old news, because now he can stay in the sit-up position and play with both hands! 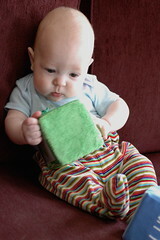 while you and i might take it for granted, it sure does take a lot of coordination and balance ( and concentration as you can see from the picture ) to play with a big, green block while sitting on the couch without falling over. one wonders what new and amazing accomplishments we'll see in the next month.